Wireless broadband ISP Wildanet, which aspires to extend their network across thousands of premises in rural parts of Cornwall, Devon, Dorset and possibly South Wales, has become the first company to be supported by an investment of £750,000 via the £40m Cornwall and Isles of Scilly Investment Fund (CIOSIF). The investment (an equity stake managed by The FSE Group) is being match-funded by the FSE Angel network, private investors and Crowdcube (crowdfunding raise) as part of a £1.5m package. Under this plan the ISP will aim to target 12,000 new customers and create an estimated 39 jobs over the next 3 years, which would be very rapid growth for a provider that at the last count had fewer than 100 customers (Sept 2018). 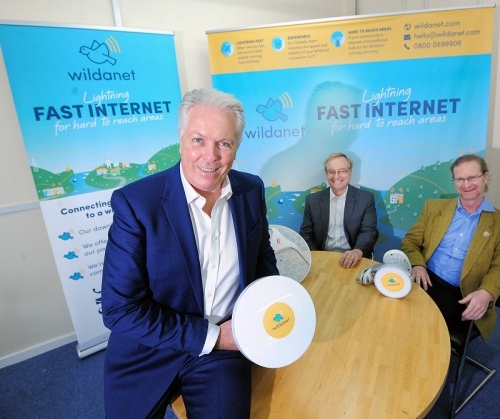 Wildanet is otherwise still fairly young (setup in January 2017) but they’ve already built a 50Mbps capable wireless broadband network for homes around The Lizard (peninsula), with speeds rising up to 1Gbps for business connections. However attaining the growth they seek will not be easy in this market. Over the same period the ISP is likely to face challenges from the on-going deployment of state aid supported fixed line “superfast broadband” networks, as well as the Government’s forthcoming 10Mbps+ Universal Service Obligation (USO) and the continued expansion of 4G and future 5G mobile networks. CIOSIF is said to be supported financially by the European Union using funding from the European Regional Development Fund (ERDF) as part of the European Structural and Investment Funds Growth Programme 2014-2020. Further investment has come from the Cornwall and Isles of Scilly LEP and HM Government. That is a lot of cash to connect 100 customers. Are there even 12000 potential customers in cornwall – the county has masses of FTTP and the council haven’t stopped? Or will they push into Airband’s territory in West Devon? Looking at TBB, cornwall has approx 10k properties currently under 10Mbps and 11.5k under 15Mbps today – finding 12000 customers doesn’t seem realistic. In fairness it’s probably worth not putting too much stock in the financial status of a young ISP or even any new business. As anybody who runs such a business knows, you often spend several years bleeding money like a trauma patient before actually making any. This is particularly true of costly telecoms infrastructure builds, which can have a long payback. In that case a better indication is to know what kind of take-up and time-scale will give them the break-even point. I’m not sure I would agree with you – there are plenty of successful small ISP’s who reach a point of modest profitability quickly before looking to expand. Crowdcube also has a pretty mixed history on Due Diligence and they take their fee regardless of outcome. I know how hard it is to fund and build businesses – but you have to walk first, remember £750k of this raise is from small private investors attracted by promises of 17x returns within 3 years… that simply isnt realistic – look at any of the larger WISP’s in the UK, Wessex, Quickline, Boundless, Airband or Voneus none have hit 12000 customers in 3 years nor would they command £2k+ per customer on an exit sale. I think what Devon is saying is where are all these 12k customers coming from?… in hard to reach areas Airband’s BDUK contracts are around £700-800 per property covered, yet Wildanet claim they can do it for sub £200 per property. Agreed on the biz plan. @Jim assume someone checked their claims in Due Diligence?